Two more presidential elections, 2016 and 2020, will be contested under the current Electoral College configuration, which gave Barack Obama a second term on Tuesday. This year’s results suggest that this could put Republicans at a structural disadvantage. Based on a preliminary analysis of the returns, Mitt Romney may have had to win the national popular vote by three percentage points on Tuesday to be assured of winning the Electoral College. The last Republican to accomplish that was George H.W. Bush, in 1988. In the table below, I have arranged the 50 states and the District of Columbia from the most Democratic to the most Republican, based on their preliminary results from Tuesday. Along the way, I have counted up the number of electoral votes for the Democratic candidate, starting at zero and going up to 538 as he wins progressively more difficult states. This process resembles how the FiveThirtyEight tipping-point analysis was calculated. In the simulations we ran each day, we accounted for the range of possible outcomes in each state and then saw which states provided Mr. Obama with his easiest route to 270 electoral votes, the minimum winning number. The state that put Mr. Obama over the top to 270 electoral votes was the tipping-point state in that simulation. Now that the actual returns are in, we don’t need the simulations or the forecast model. It turned out, in fact, that although the FiveThirtyEight model had a very strong night over all on Tuesday, it was wrong about the identity of the tipping-point state. 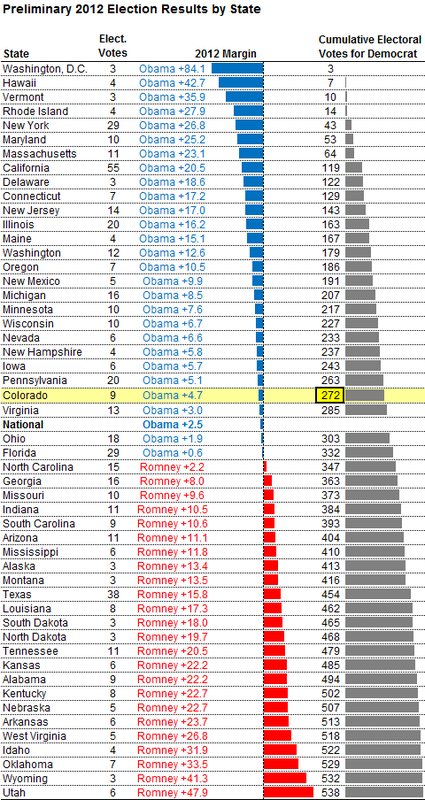 Based on the polls, it appeared that Ohio was the state most likely to win Mr. Obama his 270th electoral vote. Instead, it was Colorado that provided him with his win – the same state that did so in 2008. The worry for Republicans is that Mr. Obama won Colorado by nearly five percentage points (4.7 points was his margin there, to the decimal place). In contrast, Mr. Obama’s margin in the national popular vote, as of this writing, is 2.4 percentage points. We estimate that it will grow to 2.5 percentage points once some remaining returns from states like Washington are accounted for, or perhaps slightly higher once provisional ballots in other states are counted. But it seems clear that Mr. Obama had some margin to spare in the Electoral College. Had the popular vote been a tie – assuming that the margin in each state shifted uniformly – he would still have won re-election with 285 electoral votes, carrying Colorado and Virginia, although losing Florida and Ohio. In fact, had Mr. Romney won the popular vote by two percentage points, Mr. Obama would still have won the Electoral College, losing Virginia but holding onto Colorado. Of course, the relative order of the states can shift a bit from election to election: in 2000, after all, it was Democrats who lost the Electoral College despite winning the popular vote. Ohio might be one of the Republicans’ lesser worries. Mr. Obama did win the state, but his margin is 1.9 percentage points based on the ballots in so far, slightly less than his margin of victory nationally, and he may have benefited there from the auto bailout, a one-off event. But Mr. Obama did not need Ohio to carry the Electoral College, it turned out. Instead, states where there have been demographic shifts, like Colorado, gave him enough of a cushion. Nor was Ohio the only formerly Republican-leaning state to move closer to the Electoral College tipping point. Mr. Obama’s margins in Virginia, Florida and North Carolina also held up well as compared to 2008. Virginia, in fact, was incrementally more Democratic-leaning than the country as a whole this year, voting for Mr. Obama by three percentage points. In Florida, Democrats now seem to have a real advantage with Hispanic voters. Non-Cuban Hispanics there voted for Mr. Obama by roughly the same two-to-one margins that they did in other states, and the Cuban-American vote, long considered Republican-leaning, is now divided about equally between the parties. Mr. Obama lost North Carolina on Tuesday, but he did so by only about two percentage points. By contrast, in 2000 Al Gore lost North Carolina by 13 points despite winning the national popular vote. If these states are becoming more Democratic-leaning, which ones are shifting toward Republicans? Missouri, once a tossup, is now solidly Republican. And West Virginia, which was once Democratic-leaning enough that Michael Dukakis carried it in 1988, voted for Mr. Romney by 27 points on Tuesday. The problem for Republicans is that in states like these, and others like Tennessee, Kentucky and Arkansas, they are now winning by such large margins there that their vote is distributed inefficiently in terms of the Electoral College. By contrast, a large number of electorally critical states – both traditional swing states like Iowa and Pennsylvania and newer ones like Colorado and Nevada – have been Democratic-leaning in the past two elections. If Democrats lose the election in a blowout, they would probably lose these states as well. But in a close election, they are favored in them. The Republican Party will have four years to adapt to the new reality. Republican gains among Hispanic voters could push Colorado and Nevada back toward the tipping point, for example. States like Wisconsin, New Hampshire and Iowa are overwhelmingly white – but also highly educated, with fairly progressive views on social policy. If Republicans moderated their tone on social issues, they might be more competitive in these states, while regaining ground in Northern Virginia and in the Philadelphia suburbs. Finally, some of the Democrats’ apparent advantage in the swing states may reflect Mr. Obama’s voter targeting and turnout operations – which were superior, by most accounts, to John McCain’s in 2008 and Mr. Romney’s in 2012. It is not my job to give advice, but the next Republican nominee might be well served to remember that the party won the Electoral College despite losing the popular vote in 2000, when George W. Bush and Karl Rove put more emphasis on the “ground game.” But the Republicans seemed to be at a disadvantage in the last two years when their candidates put less of an investment into it. If the parties continue down the same paths, however, this won’t be the last election when most of the swing states turn blue. A version of this article appears in print on 11/09/2012, on page A18 of the NewYork edition with the headline: Republicans Face an Electoral Challenge.